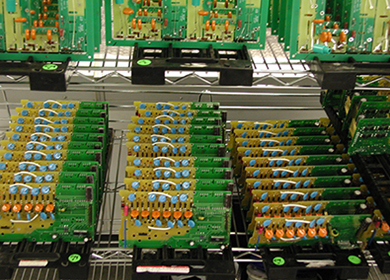 Current electronics parts shortages are occurring primarily because of the recovering economy as the supply chain hasn’t caught up with the demand being created in the electronics manufacturing industry. Even one of the simplest parts we procure, monolithic ceramic capacitors (MLCCs), are highly constrained. These capacitors are typically treated as a commodity where you don’t expect to run into shortages because availability has never been a problem. Recently manufacturers lack of production capacity to meet demand of even these simplest devices is broadly affecting the industry. In a normal distribution sales environment, distributors sell to customers on a first- come, first-serve basis. The first orders placed are the first supplied. In a manufacturer allocation environment like we are in at the moment, the manufactures instruct distribution to whom the allocated parts are delivered, regardless of purchase order timeliness. These allocations are based mostly on your history of procuring this material and the amount you have procured in the past. New customers to the table are the last to receive an allocation. The increase of embedded electronics in automobiles has also created a strain on the electronics supply change. With the proliferation of flat screen displays, navigation systems, entertainment systems, USB and Bluetooth interfacing with handheld electronic devices, control systems for both internal combustions and electric vehicle propulsion have dramatically increased usage of electronic components. Where 5 years ago, the average car would use between 2-3k capacitors, they now use, on average, 10-12k of the MLCCs. Also contributing to shortages, is the reliability and temperature range requirements of the components needed for automobiles. These parts, generally the same as used in the commercial market (but screened to tighter specifications), are sold at higher prices into the automobile market. This leaves electronic contract manufacturers scrambling trying to find capacitors anywhere in the world, in a growing number of cases, outside of normal distribution channels. Through strong relationships with major distributors that have been supplying us with components for years. Experience and industry knowledge allow us to leverage their current relationships to cover a great deal of would-be shortages for a variety of products. We also harness internal technical capabilities to cross check components with shortages to other vendors or suppliers part numbers. We encourage our customers to plan ahead and purchase as soon as possible. Try to get a material bond in place with suppliers, if you have a relationship with them. If not, get in contact with your electronics contract manufacturer and put a bill of material (BOM) in place so you can start exercising the supply chain and find your material problems. Open your AVL to as many manufacturers as possible. The increased breadth of options will help mitigate potential shortages of a particular manufacturer. Sole source components at your own peril! In procurement, it is always the more sources, the better. If you are ready to start manufacturing, contact us today to speak with one of our experts.